I'm a big believer that part of being successful is studying and understand failure. Certainly it is important to have knowledge of how to succeed. We can learn so much from leaders, coaches, programs and organization that have achieved and maintained excellence. But we should also find the time to understand those who have failed and more importantly why. 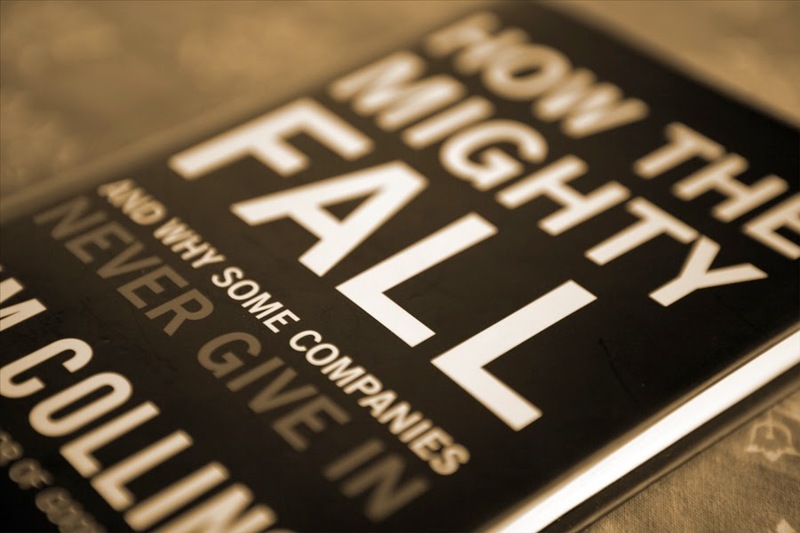 He also points out that "Great companies can stumble, badly and recover." o Great Enterprises can become insulated by success; accumulated momentum can carry an enterprise forward, for a while, even if its leaders make poor decisions or lose discipline. Stage 1 kicks in when people become arrogant, regarding success virtually as an entitlement, and they lose sight of the true underlying factors that created success in the first place. When the rhetoric of success (“We’re successful because we do these specific things”) replaces penetrating understanding and insight (“We’re successful because we understand why we do these specific things and under what conditions they would no longer work”), decline will very likely follow. Luck and chance play a role in many successful outcomes, and those who fail to acknowledge the role luck may have played in their success—and thereby overestimate their own merit and capabilities—have succumbed to hubris. o Hubris from Stage 1 (We’re so great, we can do anything!”) leads right to Stage 2, the Undisciplined Pursuit of More—more scale, more growth, more acclaim, more of whatever those in power see as “success.” Companies in Stage 2 stray from the disciplined creativity that led them to greatness in the first place, making undisciplined leaps into areas where they cannot be great or growing faster than they can achieve with excellence, or both. When an organization grows beyond its ability to fill its key seats with the right people, it has set itself up for a fall. Although complacency and resistance to change remain dangers to any successful enterprise, overreaching better captures how the might fall. o As companies move into Stage 3, internal warning signs begin to mount, yet external results remain strong enough to “explain away” disturbing data or to suggest the difficulties are “temporary” or “cyclic” or “not that bad,” and “nothing is fundamentally wrong.” In Stage 3, leaders discount negative data, amplify positive data, and put a positive spin on ambiguous data. Those in power start to blame external factors for setback rather than accept responsibility. The vigorous, fact-based dialogue that characterizes high-performance teams dwindles or disappears altogether. o The cumulative peril and/or risks-gone-bad of Stage 3 assert themselves, throwing the enterprise into a sharp decline visible to all. The critical question is, how does its leadership respond? By lurching for a quick salvation or by getting back to disciplines that brought about greatness in the first place? Those who grasp for salvation have fallen into Stage 4. Common “saviors” include a charismatic visionary leader, a bold but untested strategy, a radical transformation, a dramatic cultural revolution, a hoped-for blockbuster product, a “game-changing” acquisition, or any number of other silver-bullet solutions. Initial results from taking dramatic action may appear positive, but they do not last. o The longer a company remains in Stage 4, repeatedly grasping for silver bullets, the more likely it will spiral downward. In Stage 5, accumulated setbacks and expensive false starts erode financial strength and individual spirit to such an extent that leaders abandon all hope of building a great future. In some cases, their leaders just sell out; in other cases, the institution atrophies into utter insignificance; and in the most extreme cases, the enterprise simply dies outright. · It is possible to skip a stage, although our research suggests that companies are likely to move through them in sequence. Yesterday I post a review on the last book by Jeff Janssen titled "How to Build and Sustain a Championship Culture." As I mentioned in the review, it's an outstanding book that would benefit any coach of any sport on any level. Ultimately when your championship culture is in place, the culture leads, perpetuates, and even grows itself. Rather than you being the sole leader of the team who has to orchestrate everything, you have created an environment that is so entirely on the same page that it positively and productively leads itself. You have created a team of willing leaders rather than followers. It’s almost as if you could be away and the team could step up and do what needs to be done because they have taken ownership of the program. One of the critical systems of education is the development of your team leaders. Because these people are so critical to driving you culture within your program, you must invest the time to mold your leaders into the kind you need to be effective. It is easy to profess and practice your core values when everything is going well-when you are winning games, everyone is healthy, chemistry is great, your athletes represent your program well, and you’re getting all the calls. However, your core values will be most revealed during the difficult times like losses, when talented athletes get in trouble, and your season and/or job are on the line. We often blog about books or share excerpts of books in hope that it is something that can help you, your team or your family. On a rare occasion I will speak of a book in a "must-read" tone. Today is such a day. I have blogged about culture in the past. It is so important I made it part of our summer camp's expectation seminar titled "Creating A Culture of Personal Excellence." Step One: Defining what you want your culture to be, understanding that culture leads to legacy. Step Two: Working to teach and emphasize those components necessary to create your culture to all involved in your team. Step Three: Working each day to maintain your culture. 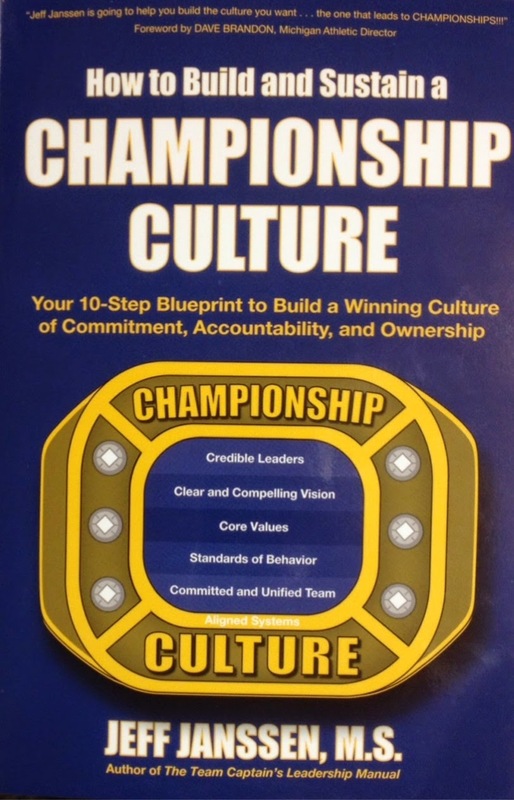 This week Jeff Janssen released a book "How To Build And Sustain A Championship Culture." It is by far the best book I have seen on this subject and would benefit any coach in any sport on any level. As Jeff says "Winners have a certain way of doing things." "Whether you realize it or not, your program already has a culture. Even if you are a new coach coming into a different program, you will need to contend with a culture that is already in place. So the question is not, 'Do we have a culture?' You do." This weekend I will have a few blog posts from "How To Build And Sustain A Championship Culture" but I would highly recommend purchasing this book. I purchased 10 copies today for some of my coaching friends -- I think it's that good. "Obstacles can't stop you. Problems can't stop you. Most of all other people can't stop you. Only you can stop you." "You may not realize it when it happens, but at kick in the teeth may be the best thing in the world for you." "The man of virtue makes the difficulty to be overcome his first business, and success only a subsequent consideration." "Adversity builds character and character makes us stronger." "When it gets dark enough you can see the stars." 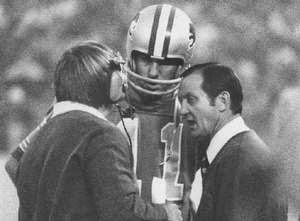 I purchased a copy of the book "Football Scouting Methods" by Steve Belichick. And as expected, it was extremely detailed. And while it had an obvious tilt to scouting football, there were some takeaways for anyone that scouts. I got my start in coaching by scouting for Ron Chambers and Doug McElwain at Winfield High School while attending Marshall University. The junior high coach Brad Hodges took me early to show me the ropes, how to best scout and what RC and Mac were looking for. I also spend some time with my junior high coach Allen Osborne and picked his brain on the topic of scouting. I learned so much from scouting -- in part because I was taught what to look for and also because I loved doing it. While at LSU on the staff of Dale Brown, in-person scouting was still a part of the game and I rarely was on the bench for an LSU game as I traveled the country as an advanced scout. Again, I learned so much from observing others. 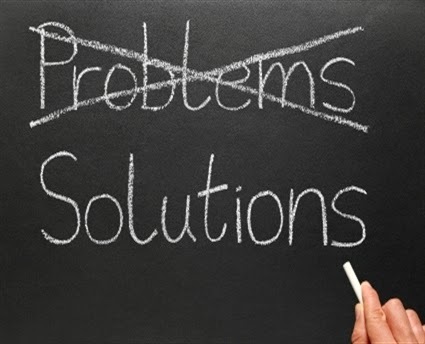 · A scout should be static in his methods, since the frequent changes in football should cause him to re-evaluate his methods as well as seek ways to improve them from time to time. · The kind of information that the scout seeks should not be left entirely to his discretion, but should be spelled out in detail by the head coach, or those assistants entrusted with formulating game plans. It is not enough for the head coach to say, “Scout the game and bring back all the information you can.” Each head coach should have definite items that he wants to know about. Often, what is of importance to one head coach is of little or no concern to another. It is to be expected that every head coach will want to know the basic offense and defense used, and on the basis of this, what can be anticipated. However, the degree to which the offense and defense is to be analyzed for tendencies varies among the head coaches. Some coaches will want every analysis possible, while others will be content with the basic alignments and adjustments. 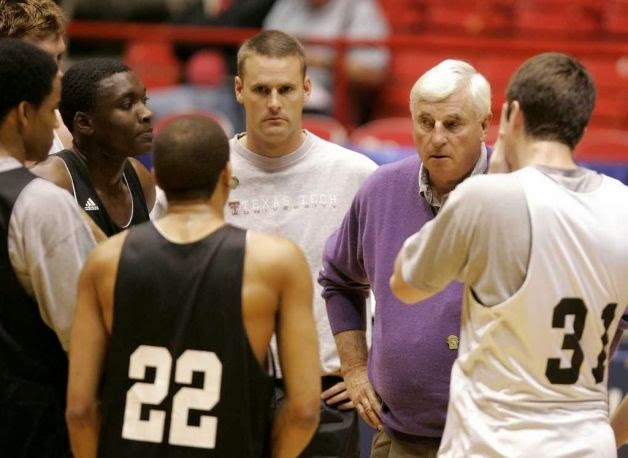 Each head coach has his own requirements; these are dictated by his philosophy of the game. · In order for a scout to do a satisfactory job, it is important that he know thoroughly the head coach’s philosophy, as well as have a complete understanding with him as to what is expected in the scouting report. · In order to enlighten the scout as to what will be expected of him, some head coaches, at times with the aid of the rest of the staff, will prepare a check list for the scout to follow. This will enable the scout to have a complete understanding of what is expected of him insofar as his search for information is concerned. · There are other head coaches who will have a final report form prepared for the scout to use in determining what knowledge he is to seek. · Regardless of what type forms are used, it is important that the scout know where to place the emphasis in his work. Some coaches will want a detailed report on the personnel, while others will stress as complete a picture as possible of the offense and defense, along with the tendencies in each phase of the game. 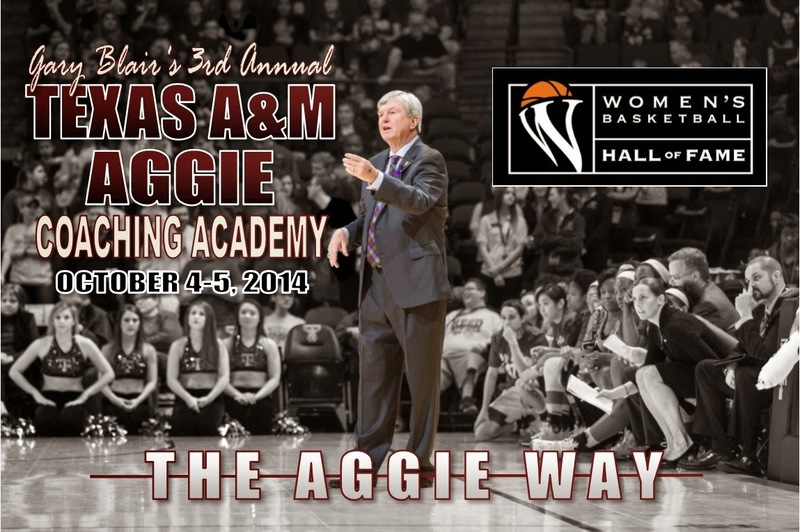 The third annual Gary Blair Coaching Academy has been set for October 4-5 at Reed Arena. Last year’s academy attracted over 100 coaches from all levels to learn from the Texas A&M women’s basketball coaching staff. 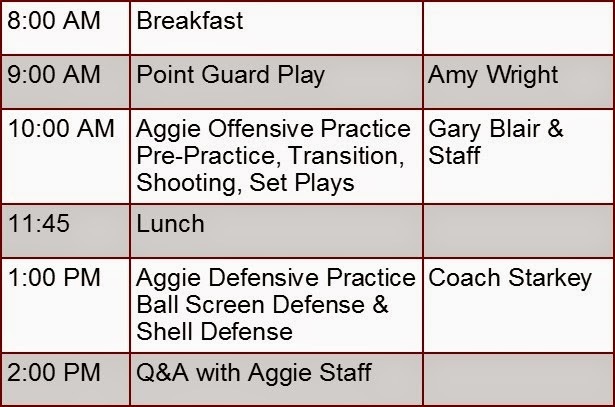 The academy includes sessions led by each of the Texas A&M women’s basketball coaches, focusing on wide-ranging topics on both the offensive and defensive ends of the floor. 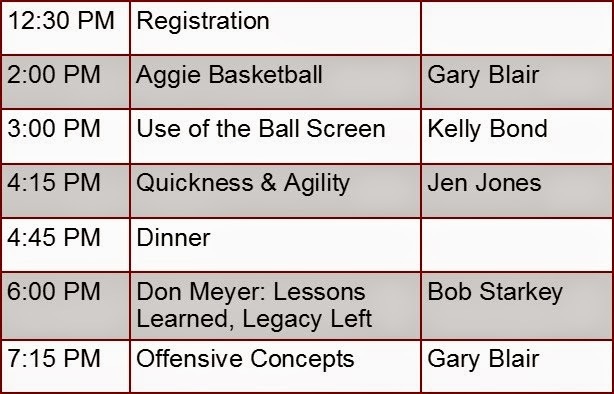 Registration for the academy includes three meals, a Texas A&M highlight DVD, a DVD of the academy sessions and a notebook that includes tips on scouting, motivation, coaching philosophy, conditioning, and practice planning, in addition to a playbook. 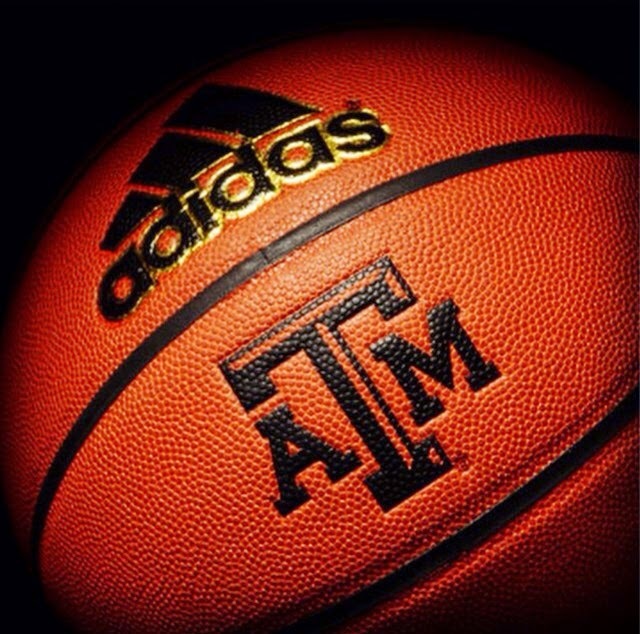 Coaches that register in advance can pay online through the 12th Man Foundation website for only $50. Interested coaches may register here. Never go online if you're angry, upset or otherwise impaired. "Practice is the best of all instructors, if the person running the practice knows what the hell he or she is doing. Improvement, especially toward perfection, comes only if the practice is demanding, well-thought-out, and constructive, by a coach who realizes that absolute perfection is unattainable-but is always the objective." · Keep coming after you get screened. 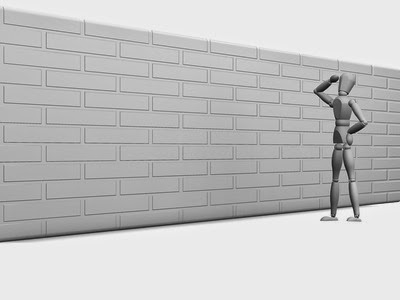 · Common strength of a good defender is that they are hard to screen. 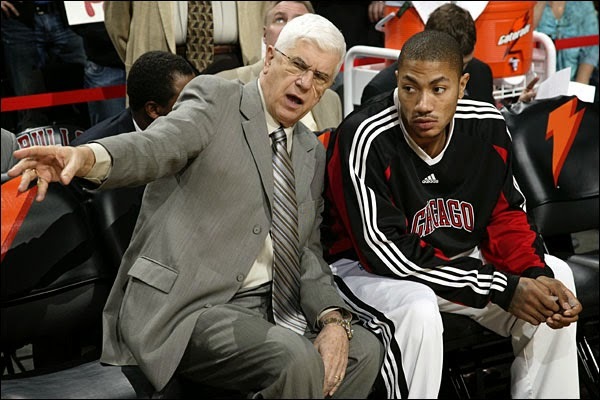 · Average defender will stop or straighten up when hit by screen. The following comes from "Be All You Can Be" by John Maxwell. o Outsmart them. If plan A doesn’t work, be ready with plan B.
I ran across this website and really liked the stuff I read -- especially this post by Eric Barker titled, "6 Things The Most Productive People Do Every Day." I'm going to share a few excerpts but you can read the entire article here. Most productivity systems act like we’re robots – they forget the enormous power of feelings. No. What you do have is more tantalizing, easily accessible, shiny things available to you 24/7 than any human being has ever had. Not one. Your routines can be formal and scientific or personal and idiosyncratic — but either way, productive people have a routine. Establish a closing ritual. Know when to stop working. Try to end each work day the same way, too. Straighten up your desk. Back up your computer. Make a list of what you need to do tomorrow. LEADERS ARE READERS -- MAKE THE TIME! Anyone that knows me knows that I love reading -- that I believe strongly in the value of reading. 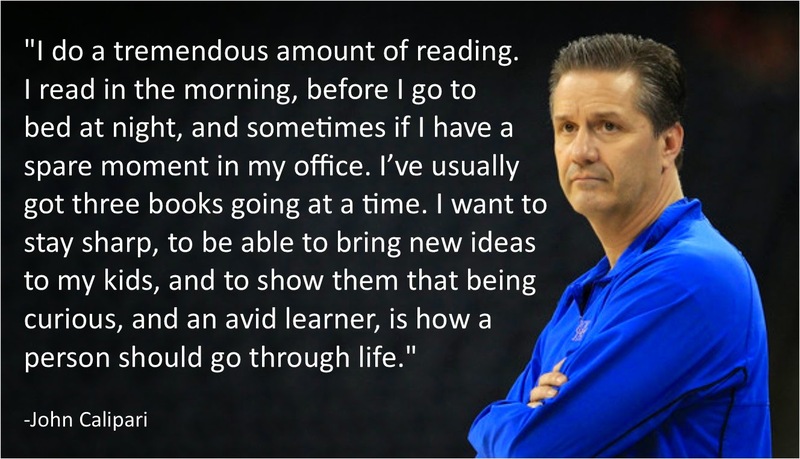 As Coach Don Meyer would say, "Leaders are readers." The amount of information available today is amazing. Books and magazines -- hard copies or digital -- are so many subjects are available. 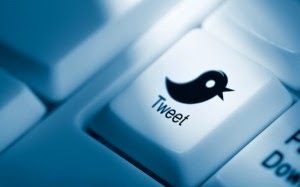 Blogs and internet sites are numerous. In the coaching profession there are so many great email newsletters. I personally utilize Google Alerts -- giving the specific names of coaches that I admire and want to learn from. Each day at 10:00 am I get an email that list anything on the internet about those specific coaches. For instance, Doc Rivers is on my list and I generally get 3 to 5 articles a day regarding Doc. From my time working with Dale Brown at LSU, I learned how to fully use a book. Coach Brown would be constantly marking his books with underlines and notes. Afterwards his secretary would type the notes for his files for him to pull out utilize with his staff, team, media, fans or in his speech preparation for organizations. This has been incredibly useful for me in allowing me to maximize my reading experience. You can see an example of one my books above. Coach Brown also assigned books to his staff to read and would annually give each player a team on the book to read as well, later having a conversation with them about what they learned. I have took that on to the programs I work with having a book for our team to read in the summer (in which they must write a book report) and then have another book for our team to read during the season (in which is accompanied by worksheets). The summer book usually steers away from basketball to broaden their horizons. This year we gave each player a copy of "I Know Why The Caged Bird Sings" by Maya Angelou. They will turn their reports in at the beginning of fall classes. Our book for the basketball season will be "Toughness" by Jay Bilas. "No matter how much we know on any subject, there’s always more to learn. Make the time to read, to study, and to think; each of these is important to your development. We all need to keep up with what’s going on in our field, too. I’ve found that news and magazine articles can be as helpful as books in this regard. The key is to keep searching so that you stay gain knowledge, improve, and stay relevant!" The following is an excerpt from a well-written article by Kelsey Meyer for Forbes Magazine titled "Why Leaders Must Be Reader." I make it a habit to re-read specific books every year because I need constant reminders of the good things they’ve taught me. After my third reading of Gary Vaynerchuk’s The Thank You Economy, I was inspired to work with our team to handwrite every one of our clients a thank-you note. Whether you re-read the same book or article to remind you of concepts, or read content on time management and organization as a constant reminder to work on these things, reading is valuable because it keeps important concepts top of mind. A female co-worker of mine, whom I respect immensely, recently gave me a book and said, “I disagree with about 80% of this, but you should definitely read it.” I loved that she was sharing a book that challenged her opinions, yet felt it was worthwhile reading for the 20% that was valuable. Reading something you disagree with can have a big impact on your ability to think, both creatively and logically. Take notes and share them with your team. An investor in our company sends me, on average, five articles a day and I always put them in a file that says “To Read.” When I have 10 minutes at the end of the day, I read an article or two, knowing that I can discuss these pieces with him later. It’s a great way for us to share ideas and inspire action in each other. Spark debates with your team. I also like using article topics to spark debate amongst our team members about how we should address a subject. I’ve heard of companies creating book clubs, where employees discuss topics in books that relate to their industry during lunch once a month. Sparking debate and sharing ideas is a wonderful way to use written content as a team-bonding tool. Back up an idea you have or a decision you want to make. If you’re one of those people who claim you don’t have time to read, then first, I question why you’re reading my measly little article. Second, I encourage you to make time. Time never “appears” for anything; you have to make it. If nothing else, learn how to multitask. Listen to content while driving or walking to work (I suggest “This American Life” and “Intelligence Squared” on NPR – I’m obsessed with both). If you don’t have time to read an entire book, read short articles online. If you’re dying to read a book but honestly can’t find the time, then pair up with a friend and take turns reading and sharing the ideas through short descriptions, or find excerpts of the book online. Purchased "The Rise: Creativity, The Gift of Failure and the Search for Mastery" by Sarah Lewis per Coach Mike Dunlap's recommendation. I've just completed it -- great read with some blog posts to come. My question is, what are you reading and what are you getting from it. I don't usually do it but I'm leaving the "comment" box open -- please feel free to let us know what book has your attention right now. I came across an absolutely great article on Derek Jeter written by Joel Sherman for the New York Post. It is possibly the best thing I've read about Jeter and some of the reasons he been so consistently successful. I've written before but to me, the true test of greatness comes with the test of time. There are many that are good, even great for a short period of time but it is the long haul that truly show us greatness. On Friday night, Jeter started his 2,610th game at shortstop. That moved him past Omar Vizquel for the most in major league history. It might not be Lou Gehrig or Cal Ripken stuff, and it came and went without confetti and fanfare. But you do not start that many games in the middle infield — all those double-play pivots, etc. — without a sense of responsibility, a reservoir of pride and a steely constitution. The day-after-day mental and physical grind ultimately defeats every athlete. But some endure better than others. And Jeter is at the top 1 percent. I remember a conversation long ago with Gene Michael when he was still the Yankees general manager. We were discussing the traditional five tools — hitting, hitting for power, running, fielding and throwing. That day I disagreed with the confines of the five tools. I suggested there were so many more than five tools. Aptitude was vital. You could have five tools, but if you couldn’t apply them, what was the use? Victor Martinez might only have two tools, but he has pretty much maximized them. That is so much more valuable than having five that excite scouts but never come out in games with consistency. Grace under pressure is a tool. Again, you could have the physical stuff down, but if you can’t do it with 40,000 people in attendance or in October, what is the point? Discipline is a tool. Are you going to keep working out, avoid perks that could drain your energy and skill? And durability is a tool. Danny Tartabull used to tell me to project his stats over a full season and I finally told him, “Why? You never play a full season.” Mark Buehrle might not be blessed with the stuff that makes scouts drool, but wind him up and he gives you 200 innings. Every year. Year after year. Because I believe it is in all these areas beyond the traditional tools that Jeter was an A-plus and took very good traditional tools to a Hall-of-Fame level. His aptitude, his grace under pressure, his discipline and — for me — especially his toughness. Chili Davis Code: If I am playing, I am healthy enough to play. He never played the “I am 80 percent” game to provide an alibi. Never told you off the record how he was really feeling, again, as a way to set up the excuse. “I’m all right.” That he what he told managers and media. 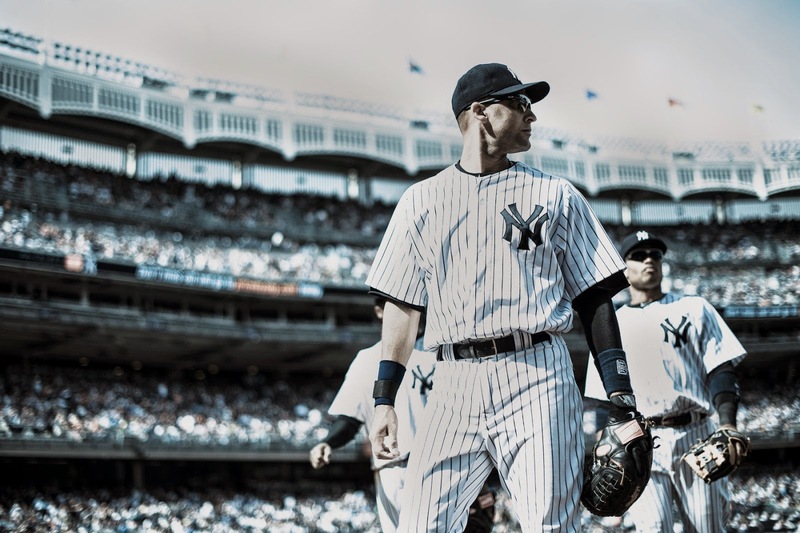 Jeter felt a responsibility to play, that the team was best when he did. Torre and Joe Girardi have known they could write his name into the lineup game after game, season after season. Do you know how much easier that makes the managing job? THE MINDSET OF A "CLEANER"